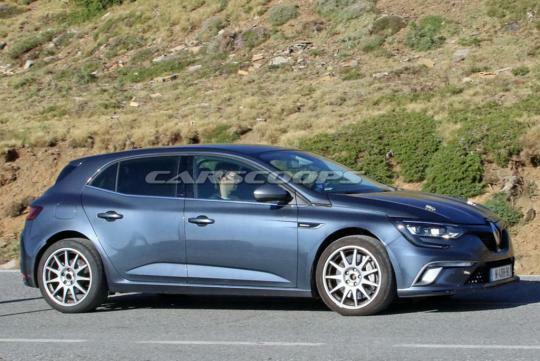 Renault's next Megane RS has been spotted in South Europe doing some testing with minimal camouflage and for those who are hoping to see it in three door guise, you might be disappointed. 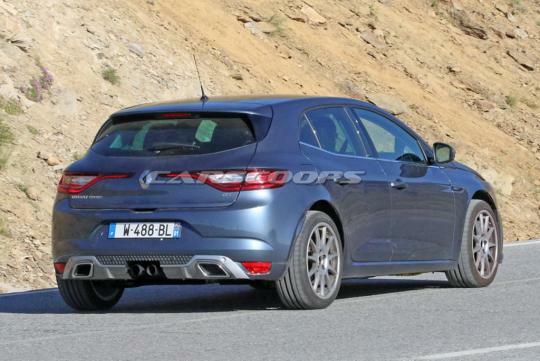 As reported by Carscoops, the new car has a few RS characteristics, such as the twin center exhaust (the exhaust openings at the end of the diffusers looks fake), the large Brembo brake calipers and new wheels. It also gets a more aggressive front bumper, wider fenders, beefier side skirts and a pronounced rear diffuser. Expect the new car to be fast, with rumors claiming it will have upwards of 300bhp, courtesy of a 2.0-litre turbocharged four. Power will be sent to the front wheels through a dual-clutch transmission or a six-speed manual. Set to debut at next year's Geneva Motor Show, expect the first cars to reach customers by the end of 2017. The side view looks kinda like the merc A class. Renault reliability has improved tremendously so i wont be surprised that they will do better and better in Singapore. Service level is good too. I like the looks. But the rear diffuser looks like a Shenzhen Special.